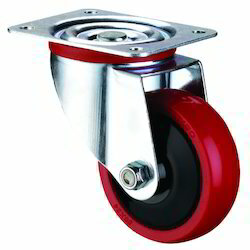 Pioneers in the industry, we offer trolley wheels from India. We are the engaged trader and distributor of an excellent range of Trolley Wheels. These are manufactured using superior quality raw material and have excellent resistance to corrosion. We strive hard to design these products accordance with international quality and standards. These are finely fabricated using superior quality factor inputs procured from reliable suppliers. These are available in all sizes.